Whether you work at home or in the office, the right coil binding machine can bring life to the most bland presentation materials. Coil binding, also called spiral binding is a popular way to bind a cover and pages of a document together into a book. People choose this method because it’s relatively easy and hassle-free. Coil binding machines (also known as wire binding machines) use spirals, or spring-like coils, to join the pages together either by a manual or electric process. Our favorite is the TruBind TB-S20A. It has a decent capacity, is sturdy and easy to use. If you’re on a budget, the Fellowes Star+ Comb Binding Machine is an easy to use and affordable option for small to medium size jobs. Machines built for handling low volumes are most commonly purchased for personal or occasional use, while mid volume machines are more appropriate for those who need to bind multiple books each day. If you need to bind dozens of books (or more) each day, you will want to choose a high volume machine for that. One major factor you should consider when choosing a machine is how many pages it can handle at a time. While some machines will only take a few each time, others are capable of handling dozens at once. People who are looking to save money might opt for a machine that costs less and takes more time to bind thicker books. But if you are working with limited time and need to bind several books each day, we recommend that you go with a more powerful machine. Some options come with an automatic spiral inserter, which is useful for saving time but not necessary for those who only need to bind a couple books each day. Many low or mid volume machines will require you to insert the spirals through the holes manually, but coil inserters will do the job for you. Again, you just need to decide what suits you best in this regard. Let’s look at some qualities that you should aim for, no matter which type of coil binder you end up buying. 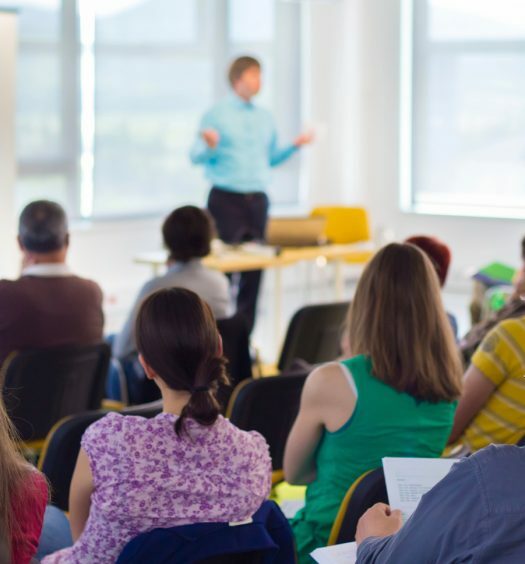 Coil binding is something that you do to save time and improve efficiency, not something you should have to dedicate days or weeks of time to learning. The design of the machine you choose must be intuitive and easy to figure out quickly with some simple instructions. Not only will this ensure that you have an easy time using it, but that others will if you decide to keep it at your workplace for your colleagues to have access to. When you need to bind multiple books per day, saving time is important. The process of inserting the coil with the machine should be quick and simple, taking just a few seconds. You can then crimp the ends to prevent it from unraveling with pliers (often included when you order the machine). Stability is a must with any office product. You want something that you don’t have to replace very often and that feels heavy duty. But that isn’t the only benefit of a quality design. It’s easier to be productive at work or home when your surroundings look nice, and that applies even to coil binding machines. Go for a design that is not only simple, efficient, and functional, but that looks good in your office, instead of like an eyesore. When you only need to bind one book, you might want to do it by hand. When you have multiple books you need to coil bind, on the other hand, having an electric or automatic option is very convenient. Choose a product that has the best of both worlds, and you will always be prepared no matter what your binding needs are at the moment. With the qualities above in mind, we have compiled a list of the best coil binding machines available on the market. Let’s take a look at them and of the features they offer. Here are the best coil binding machines based on performance, value, quality, and overall user experience. This machine is able to punch 20 sheets of paper at a time. This process is made simple by the included handlebar, suitable for right-handed, left-handed, or even double-handed operation. This machine is nice and lightweight which makes it portable to your office or home. The machine uses 4:1 pitch coils (plastic) which you can twist in manually, or insert using the electric roller at the machine’s top. You will prefer the auto-feed option if you want to be able to make adjustments to the length of the pages you’re punching. When you can adjust this, it makes cleaner holes, but even if you prefer doing it yourself, self-feeding the spirals is quite simple. This product will bind books that are up to 2 inches in thickness and there are heavy-duty pliers included with it for crimping the ends of the coil once it’s finished. This machine weighs 15 pounds and its dimensions are 10 by 15 by 18 inches. Even for beginners, this machine is simple and easy to figure out and is very versatile. Not only is it easy to use, but simple to clean and measure, as well. Make sure that you practice with it before using it for something you can’t print again, just to be safe. Get the edges lined up and test the feeder out until you can do this without error, then you can start to print books. This will require a bit of practice and patience, as any other machine does at first. Many people have businesses or courses that they regularly need to bind instruction manuals or travel information for, and usually, hire others to do it at office supply stores. Making an investment on a coil binding machine ensures that you save money in the future, get it done the way you want every time, and save yourself the hassle of taking trips to the store when you need to make a book. As soon as you buy it, you will likely discover new purposes for using it constantly. The instructions that come with the machine are basic but cover all you need to know. There are a few tips you will find helpful when using this machine. The included crimping tool will require a few attempts to get used to, and the mechanism for punching holes will need oil. Using a sheet of paper to catch residue will help keep your end results looking polished and professional. When you are using the binding wheel, make sure you’re using the correct sized spirals and do the correct preparations for the machine before proceeding so it will spin at the right speed. Check Price of the TruBind TB-S20A on Amazon. The TruBind Heavy Duty Electric Coil Binding Machine with Coil Inserter (TB-SD600) is our best upgrade pick on the list and can punch 25 sheets at a time. This machine presses forward instead of pushing vertically, meaning that its motor doesn’t have to fight gravity and lasts longer. It uses 4:1 coils, which you can manually twist into the pages of the book or use the rapid coil roller to insert. This can bind books up to 2 inches in thickness and comes with heavy-duty pliers for crimping the ends of the coils. This product is not flimsy by any means. Its updated design is crafted from solid metal and was built to last. The machine weighs 63 pounds and its dimensions are 7.9 by 17.7 by 16.9 inches. It makes coil binding and hole punching simple, efficient, and affordable. The foot pedal works for hold punching, making the process more automatic so you don’t have to press the button each time and the device is very quick overall. The design is straightforward and easy to get used to. It comes with a specified power cord to use for the roller and another separate one for the hole punching. Keep in mind that you should keep your hands away from the coil edges since this could result in getting your finger poked. If you are using laminated sheets of paper in the machine, don’t put more than 4 in at one time. There is a warranty on the product for 1 year, but that doesn’t apply if you broke it by putting too much in the machine and overloading it. Check Price of the TruBind TB-SD600 on Amazon. The Akiles Coilmac Binding Machine is a manual punch and comes with an inserting table for productivity and efficiency. This is one of the easiest machines of its type to operate with its range of abilities and functions and its high-quality parts. It’s one of the most durable models available, flexible and adjustable for varying jobs, easy to operate and very heavy duty. The machine weighs 34.2 pounds and has dimensions of 11.2 by 17.5 by 21.2 inches. The oval holes offer you even more flexibility with what you can bind and are easier to align. This machine is built like a tank and designed to last. It’s easy to assemble, even for the inexperienced, fun to use, and made of heavy steel. The siding design is done in crinkle aluminum and the device has a wooden handle, giving it an attractive look that will fit well in your home or office. Its function is smooth, powerful, and precise. A great tip to use when printing a Google Book file that has yellowed is to apply a black and white filter to it. This will print the pages out with a white background instead of gray, which needlessly wastes a lot of toner. Check Price of theAkiles Coilmac on Amazon. The TruBind TB-S20 Spiral Coil Binding Machine (TB-S20) can punch 20 sheets at a time and comes with a full handlebar for two-handed, right-handed, and left-handed operation. The machine is built to be lightweight, so it can be easily moved from location to location. It binds documents of 2-inch thickness or less and the coils can be manually inserted and twisted into the punched holes. You can use the electric bind, which is a spinning, motorized wheel that puts on the binding, however, many will find it easier and quicker to do this by hand. The product comes with a pair of pliers for crimping and cutting. If you aren’t sure how to use these, a quick search online will pull up some YouTube tutorials for correct use. Whether you have ever used one of these or not, this machine is easy and works well each time you need it. It’s sturdy, well-constructed, and has plastic on the outside with metal inside. Use this to punch 16 mil back pages, 10 mil clear cover pages, 110# cardstock, and 26# pages. Our digital age seems to be trying to phase out physical books, but they are still very useful, and some prefer to have a tangible book to write and highlight in, making this device a godsend. Print out PDF files of your favorite fiction stories, or even of important college coursework, and keep your pages safe with coil binding. 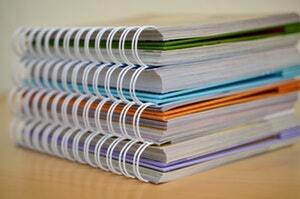 Textbooks for school can get really expensive, so save $150 by printing what you need and binding it yourself. When you do this, you won’t have to worry about tearing pages out of your 3-ring binder anymore by accident. If you are new to using this product, it’s helpful to know that the page’s “depth margin” is how far in from the paper’s edge the holes will go. This can be done with either 4.5mm holes or 6.5 mm holes, and the 4.5 option will end up looking like the average professional coil-bound booklet. Check Price of the TruBind TB-S20 on Amazon. This is our best budget option on the list. The Fellowes Star+ Comb Binding Machine is affordable and specially built for medium or small volumes of pages. It uses a manual inserter for the coils and can handle 15 sheets of paper at a time. Do not overload this machine, however, as this could cause it to jam up. It’s limited to 150 letter size sheets with a 3/4 in coil. Paper for the Fellowes Star+ is inserted vertically and is pretty simple to load, giving a professional finish to books 11 inches long or shorter (letter size paper). Your pages will punch evenly and consistently, lining up very well. Strictly speaking, it is not a coil binding machine, but rather a comb binding machine. Check Price of the Fellowes Star+ on Amazon. How Does a Coil Binding Machine Work? The coil binding machine first punches holes through the edge of the small stack of pages, then the coil is sent through, resulting in something similar to the classic spiral notepads most of us used in high school. One thing that sets those classic notebooks and coil binding apart is that coil binding machines can use PCV plastic instead of metal. You can choose between a metal coil or one made of this durable plastic, and the coil is then twisted through and inserted into small punched holes along the spine of the cover and book pages. This coil brings together the cover and pages as a final unit but allows you to still open and access them all freely and easily. This type of machine is useful for studying purposes, office environments, and more. In an age where books are increasingly available online, this gives those who prefer to hold a real book a chance to print material out and make one themselves at home. Perhaps you want a book that is out of print. A machine like this offers you the chance to find it on the internet and get it anyway. 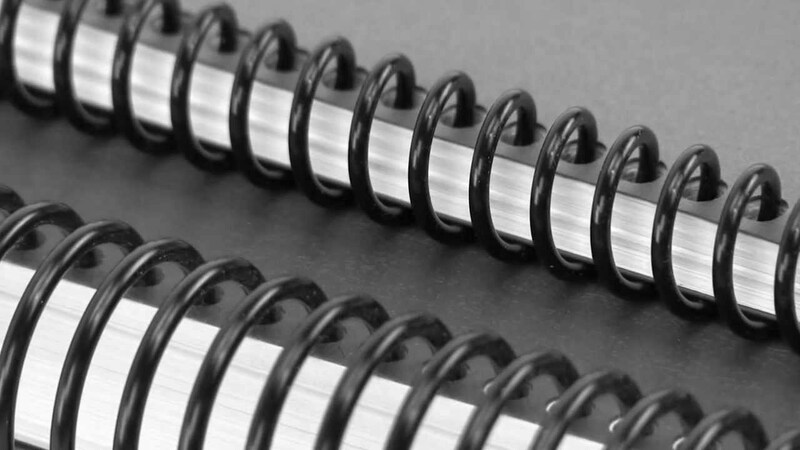 There are a few different options for binding books, such as perfect binding and saddle-stitching, but coil binding comes with some distinct benefits in comparison to those methods. When you coil bind a book or booklet, you can open the pages an entire 360 degrees. A book that has been spiral bound is able to fold back on itself completely and stay flat, allowing for quick reference without taking up a lot of space on your table or desk. This means coil binding is a great option for maintenance manuals, instructional books, recipe books, directories, sales presentations, and reports. It’s also perfect for calendars since they will lay flat on the wall easily. Travel guides and atlases are often coil bound, also, since this makes the pages easier to access during travels. And since you can open them up all the way, you have a full view of each page’s information. When you use a coil binding machine to join your pages together, the sheets stay where they are and turn easily. When you open the book, its pages rotate without resistance due to having no tension in the spine, unlike alternative styles of binding, which means you don’t have to hold the book open to read it. Spiral coiled books are versatile with how many pages they can hold and come in various diameters for making books of differing thicknesses. The higher the number of pages you are binding, the bigger the diameter of coil you’re using needs to be. This is so that it functions correctly, and for a better result aesthetically. The process of coil binding functions perfectly with index tabs, which is another advantage to this method. Since coil binding allows the pages to stay in place and turn freely without being forced or held open, it’s useful for projects that need labeled dividers for easy access to information. Labeled tabs are a great addition to any type of reference document, like directories, training manuals, presentations, and progress reports. They save time with locating what you need, allowing you access to necessary material within seconds. These tabs are usually designed in a variety of colors or numerically coded for extra convenience. As stated earlier, the coils used can be either metal or plastic, but plastic offers a wider choice of colors to use. In addition, plastic tends to hold up better than metal, getting less distorted over time. This is important to note if you will be sending your calendars or bound books in the mail. This binding method is readily available and widespread, especially in shorter runs of production. Not only is it a straightforward and simple process, but it requires no time-consuming preparation or adhesive materials. Machines for coil binding are available in various sizes and shapes, typically depending on how much volume they can bind at a time. These machines are usually categorized in either low, medium or high volume. They might also be classified as electric or manual and this distinction is up to the user’s discretion. Some won’t mind using a manual handle for punching the paper, while other users will prefer to use the electric option for keeping their hands free. The majority of high volume coil binding machines will have a motor on them. Hopefully, you’ve chosen the right coil binding machine, meaning that it’s simple to figure out. Just in case you’re completely new to using one of these devices, however, these guidelines will help you get the best results when you do. Get it set up. The first step is to decide where you’ll be keeping your machine and set it up there. Adjust the punching dies, guides, and margin depth as you see fit. This is a good chance to do some test pages if you know how before you start the process of punching your book. Get your book pages ready. The next step of the process is to assemble your book, including the front cover, middle pages, and back page. Make sure they are all lined up and facing the correct direction and that all of the appropriate adjustments and edits have been made. Select your pages. Coil binding machines can only accept a specified number of pages per punch, so the next step is to select your first pages. If you’re uncertain about how many your machine can handle, look at the instruction manual. Keep in mind that doing the highest number of pages possible for each punch might cause your device to wear out faster than doing a little less than maximum each time. Plus, going to maximum capacity will prevent your machine from jamming, which can be a time-consuming hassle. Use the hole punch. Now it’s time to use the hole punch, section by section, on your book. Depending on how long your book is, this might only take a couple of punches, or even 5 or more. As you punch each stack of sheets, put it aside and ensure that they are all properly ordered. Depending on your machine, you might be pressing the automatic punch button or using the handle to punch the stacks of paper. Assemble the punched pages. Now take all of your punched sheets and organize them, making sure the holes are perfectly lined up as much as possible. Insert the coil: At this stage, you will be spinning the metal or plastic coil through the holes, starting with just a few. Then allow the coil inserter to spiral the material through the rest of the holes, which will be manually achieved with some devices. Ensure that you have at least a quarter inch of coiling material that extends beyond the book edges, on either side of the book. Crimp the extra coil. Now you can use your set of crimping pliers for bending the coil so that it stays where it is, removes any excess, and doesn’t poke anyone on accident. As mentioned earlier, if you aren’t sure exactly how to use these pliers, there are plenty of instructional videos online that will show you how. Congratulations, you now know how to coil bind a book.